NOTE: THIS ARTICLE WILL GET INTO SPOILERS FOR BATMAN: THE ENEMY WITHIN EPISODE 1: THE ENIGMA. IF YOU DON’T WISH TO HAVE THE EPISODE SPOILED, TURN BACK OR READ MY SPOILER FREE REVIEW HERE. There’s a LOT to unpack in the season premiere of Telltale’s Batman: The Enemy Within, and in my chosen review format where I avoid plot spoilers, I couldn’t talk about a lot of things that happen within the chapter that I really wanted to. Because there’s so much to talk about, I made the decision to make a companion piece to my spoiler-free review wherein I get to into things that give away crucial plot sequences for the episode. I don’t know if this will become a regular thing going forward for all Telltale episodes or if I’ll just do something akin to this for season premieres, but I at the very least wanted to really dive deep into The Enigma because it sets up so much stuff going forward for Telltale’s take on the Batman mythos. This if your final warning, turn back now if you don’t want the episode spoiled for you. Two characters are killed off in The Enigma on both sides of the conflict and I didn’t particularly like how either were handled. They added stakes to the proceedings, but one didn’t feel like it had the weight it should have and the other took a lot off the table for future episodes. The first character who meets an untimely end is Bruce Wayne’s friend and partner in his crusade, Lucius Fox, and this was something that was shocking, but at the same time I felt like this maybe should have been held for later in the season. Before his death at the hands of one of Riddler’s puzzles, you meet Lucius’ daughter Tiffany who is just as tech savvy as her father, maybe even more so, and Lucius asks Bruce is she should be brought into the fold. I chose to leave her out of it knowing what can happen to loved ones that are linked to super heroes in comics but then shortly after Lucius meets his end. At Lucius’ funeral when pressed by Tiffany how her father died, I was honest and told her that Bruce was at fault by giving him the Riddler’s puzzle box to inspect. It severed the friendly relationship Bruce had with Tiffany who in the previous scene was going to check up on a PTSD suffering Alfred who is still in shock over the ordeal with Lady Arkham. It will remain to be seen if Tiffany eventually replaces her father as Bruce’s go to tech support similar to how Marvel as of late has been crafting legacy characters for a lot of their characters. I do wish that Lucius’ death would have been held for later in the season to give it more weight because he really hasn’t been in this series that much, but at the same time I’m intrigued by my decisions to see if Tiffany will become an enemy to Bruce, or if she’ll turn around after maybe figuring out that Bruce is Batman and what her father was doing instead of being home. Will she resent Bruce for putting him in that role, or will she continue where her father left off? The second death occurs at the very end of the chapter and it’s again one I wish would not have happened. That character is the Riddler who I’m surprised they got rid of him seeing as in the launch trailer it looked like they were positioning him to be the main villain this season. I like that Telltale is bold with how they’re handling the Batman license as it makes for a compelling story, but to take the Riddler out this early seems like a bad call. There’s always the chance that you’ll see more of his time operating during Thomas and Martha’s turn as crime bosses when he was younger and having a full Riddler arch where he’s introduced and caught made this one episode feel like a full season in its stakes. I really wanted to see more of the Riddler though, even if he returned in a third season, and not see him be a one-and-done character. Conversely I can see a cat-and-mouse game between Batman and the Riddler maybe growing stale over the course of a full season, but also the way Riddler carries himself like he’s the hero Gotham deserves by crossing the lines that Batman won’t is something that really could have been expanded on. DID THE SUICIDE SQUAD BETRAY THE RIDDLER? Upon arriving at the scene of Riddler’s death, Waller informs Batman that dangerous foes have arrived in Gotham, adding more fuel to the Suicide Squad fire, and continues by saying that Riddler was in a struggle for power with another member of his group: Dr. Harleen Quinzel. Once again subverting what is expected, Telltale looks to be establishing Harley as a criminal before the Joker, but there still could be a link between the two before the events of The Enigma. Waller tells Batman that Harleen was working at Arkham where John Doe used to be an inmate. 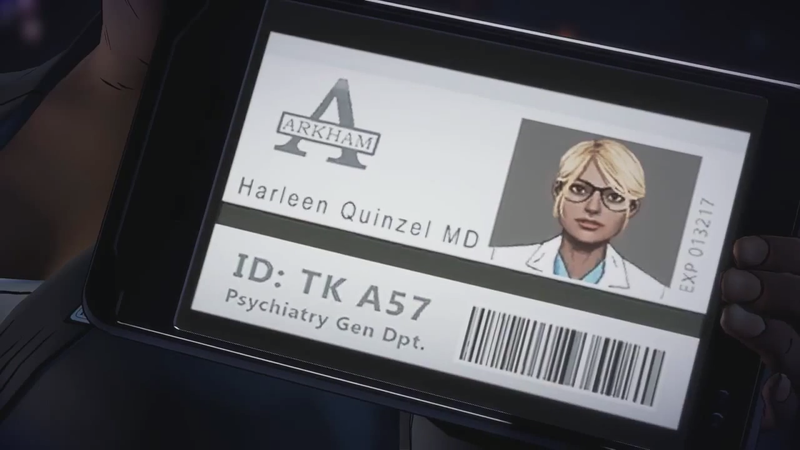 It’s never said in Batman: The Telltale Series during Bruce’s stay at the asylum that Doe was treated by Harleen, but Bruce was only there for a few days at most and this could be addressed in a flashback down the line. When John “Joker” Doe crashes the funeral of Lucius Fox, he, in my game at least, told Bruce he wanted him to meet some new friends of his and shares a distaste for the Riddler, so much that he points Bruce in the direction of where he can be found. Riddler states on his death bed about a white faced man messing up his plans, clearly referring to John Doe. Could John Doe have been the X factor that caused Harley to turn on the Riddler, or did she just plan to do so all along? If you want to discuss The Enigma further you can do so in the comments below, and if you want me to do things like this in the future, or also to never do something like this again, feel free to also make that known in the comments below.